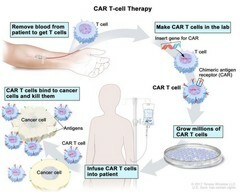 CAR T-cell therapy; drawing of blood being removed from a vein in a patient’s arm to get T cells. Also shown is a special receptor called a chimeric antigen receptor (CAR) being made in the laboratory; the gene for CAR is inserted into the T cells and then millions of CAR T cells are grown. Drawing also shows the CAR T cells being given to the patient by infusion and binding to antigens on the cancer cells and killing them.